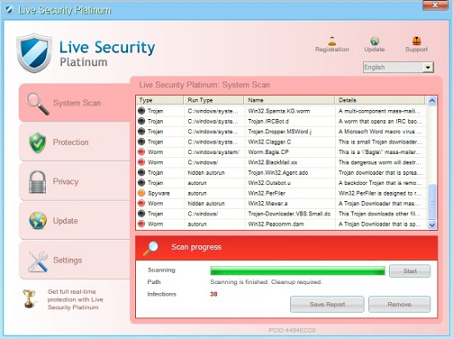 In the next the procedure on how to remove the trojan Live Security Platinum. Att. : AVG Business ed. until today does not recognize this trojan. Login with a different account (window Live Security Platinum probably will not activate) and launch regedit. Now you have to search in all the key named “RunOnce” a value like that. Now you have to delete this entry in regedit and the related folder in the drive. Restart and check if the the trojan was removed. For safety now you can use Malwarebytes Anti-Malware Free to search and clean other issue related this trojan. This entry was posted in Windows and tagged Trojan, Windows by Giampaolo Tucci. Bookmark the permalink.